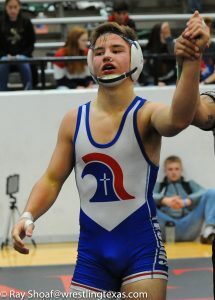 Home » featured » Prep Wrestlers Headed to Prep Nationals, Noah Miller MOW. Prep Wrestlers Headed to Prep Nationals, Noah Miller MOW. On Saturday, Feb. 2nd, the 2019 Texas Prep State Championships were hosted at St. Mark’s School of Texas. This event includes all private schools from both the Southwest Preparatory Conference (SPC) and Texas Association of Private and Parochial Schools (TAPPS). SPC is an athletic conference comprised of certain high schools in Texas and Oklahoma and includes schools like St. John’s, St. Mark’s, Episcopal School of Dallas, Episcopal High School (Houston), The Kinkaid School and others. TAPPS is an athletic conference that includes schools across the state, including St. Thomas Catholic, Liberty Christian School, Bishop Lynch, All Saints Episcopal, Bishop Lynch, Bishop Dunne, McKinney Christian, Dallas Christian among others. The top 3 placers at the Texas Prep Championships every year qualify as the Texas representatives to compete at the annual National Prep Wrestling Championships hosted at Lehigh University. There, our Texas wrestlers get to compete against the top Prep schools across the country, including Blair Academy (NJ), Wyoming Seminary (PA), Malvern Prep (PA), McDonogh School (MD), St. Paul’s School (MD), McCallie School (TN) and many others. This year’s 84th Annual National Prep tournament will be held on Friday/Saturday, Feb. 22-23, 2019. Last year, Colin Lawler (Kinkaid/NC State) won Prep Nationals at the HWT division. The following Texas wrestlers also earned All-American status at the 2018 Prep Nationals: Tucker Ribman (St. Mark’s/Harvard), Hunter Balk (TCA/Arizona State commit) and Noah Chan (Kinkaid/Franklin & Marshall). Congrats to St. John’s School for winning the team championship and to all the Texas wrestlers who qualified for the 2019 National Prep Championships. Special congratulations to Noah Miller (TCA) for being awarded MOW. He won the 160lb division yesterday and is a 4x Texas Prep State Champion.